One of the most frustrating things to come up against in a discussion or disagreement is someone who frequently interrupts. Isn’t it annoying when you can’t finish speaking your thoughts, let alone complete a full sentence? It’s called conversation hijacking. It clearly demonstrates a lack of interest. If that’s something you’re guilt of you absolutely need to learn how to be a better listener. One of the simplest ways to show people you care about them is to listen when they speak. But for many people, that’s easier said than done. The next time you’re with some female friends, notice how often you interrupt each other. You’ll do it to add a thought to someone else’s, agree with her, or add your experience on the subject she’s talking about. It happens all the time, but it’s incredibly rude. It says that you don’t really care about what the other person is saying; that you just want to talk about you. While you’re talking about you, or thinking about what you want to say next, you’re missing what she’s saying—or trying to say. You’re not listening. You’re frustrating the speaker. When you interrupt your partner in a relationship, it prevents you from resolving issues and getting your needs met. Most people will just shut down and stop trying if they feel like you’re not listening anyway—especially if it’s not easy for them to share their feelings. Please don’t hijack conversations! If you’re too angry or worked up to be able to listen to what your partner is saying, ask to take a break until you can calm down. What really happens while you’re taking that break is that a different, less reactionary part of your brain has time to kick in and handle things more reasonably. The best way to force yourself to really listen to what someone is saying is to repeat it back to them in your own words when they’re finished. Don’t even try to think of a response yet; the desire to respond is what motivates rude interruptions. Put all your attention on listening actively. Then only after you fully comprehend what has been said to you can you start to reply. Turn off the TV, computer, music, cell phone, and anything else that could interrupt or distract you. Say you want to take turns speaking, that you’d like to finish your whole thought before your partner responds, and that you’ll offer the same respect to him or her. Give your partner your undivided attention. Don’t look away or around the room. Occasionally nod or say “yes” or “uh huh” to let your partner know that you are listening. You can smile if you want when you agree, but don’t fold your arms or make dismissive faces when you don’t. Don’t roll your eyes, shake your head, sigh, or laugh sarcastically. Keep your body language open. Keep your shoulders square to your partner and sit still. Don’t fold your arms or play with your clothes, hair, or jewelry. Never assume you know what your partner is going to say; in fact, assume you don’t. Most importantly, don’t plan your rebuttals while your partner is talking. That’s how miscommunication occurs. That’s called active listening. If you can master actively listening in every important conversation you have I promise you’ll have much happier relationships. 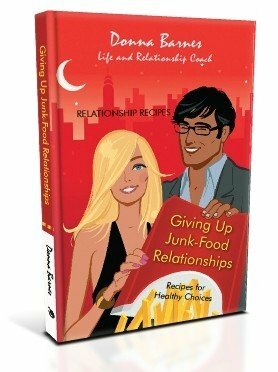 Giving Up Junk-Food Relationships will help you recognize and create a happy, long-lasting relationship with healthy communication.